After washing my hair I focus on cleaning my body. This of course includes body scrubs (yes plural, I like to use multiple scrubs on different areas! ), a moisturising soap on my under arms and an intimate wash, for well, intimate areas! 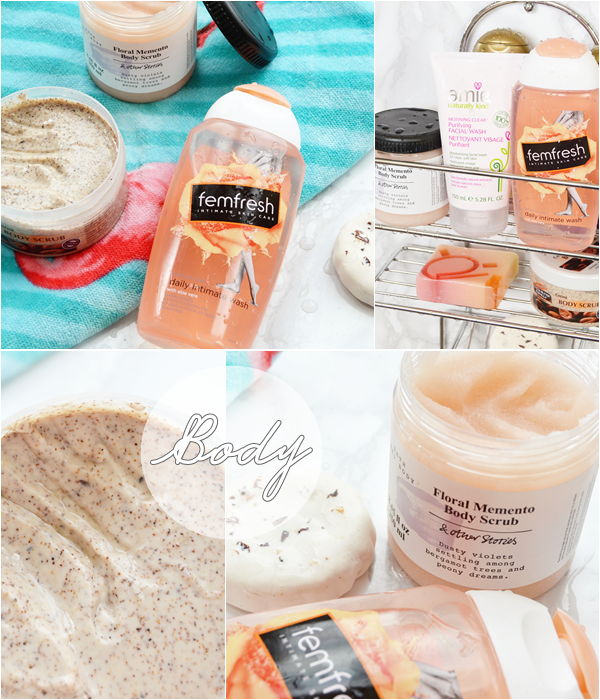 As I mentioned above, body scrubs are my thing! Currently in my shower is the gorgeous & Other Stories Floral Memento Body Scrub (£7.00 - & Other Stories here) which is just delightful for summer with a true floral scent. I find it nicely dense but not over harsh to exfoliate my skin well, leaving it silky smooth. This truly is a treat to use! When I'm fancying something less summery and for more evening showers I opt for the heavenly Palmers Cocoa Body Scrub (£4.99 - Superdrug here) which smells more like a dessert than a shower product! I find this to be a looser scrub that lighter buffs the skin making it great for everyday use. I also totally rate the Soap & Glory Sugar Crush Body Scrub (£8.00 - Boots here) which is amazingly zingy and refreshing for summer. Soap in the shower may seem out dated but I personally love them, especially handmade soaps from the likes of Bomb Cosmetics and Lush which offer something unique. My personal favourite soap comes from Lush and it's the Sultana Of Soap (£3.40/100g - Lush in-store) this soap creates a rich lather and is perfect for dry skin, which is why I like to use this on my under arms and my legs to shave with. If you think all soaps are drying then this is the soap to change your mind! Then for the rest of my body when I'm not wanted to use a body scrub I love to the Hawaiian Flower Soap from Bomb Cosmetics (£2.49 - Bomb Cosmetics here). This is a burst of citrus fragrance that fills the entire shower making it ideal for summer and to energise with. Lastly for body care in the shower I like to use femfresh Daily Intimate Wash (£2.99/250ml - femfresh here). This lightly scented wash is perfect for the delicate intimate area where a gentle pH-balance is needed. The low pH formula helps to maintain a healthy pH balance down there to keep skin happy! This is also soap-free and lightly scented with a touch of aloe vera which has it's own soothing properties. If you are unsure what shower gel to use and if it will be sensitive enough, then this is a great choice to go with. Onto skincare now which I like to keep to a minimum in the shower and something I leave until last as I feel by then the heat and steam will have opened my pores. I also like to stick to gentle products that don't strip the skin anymore making my oily skin type more oily. 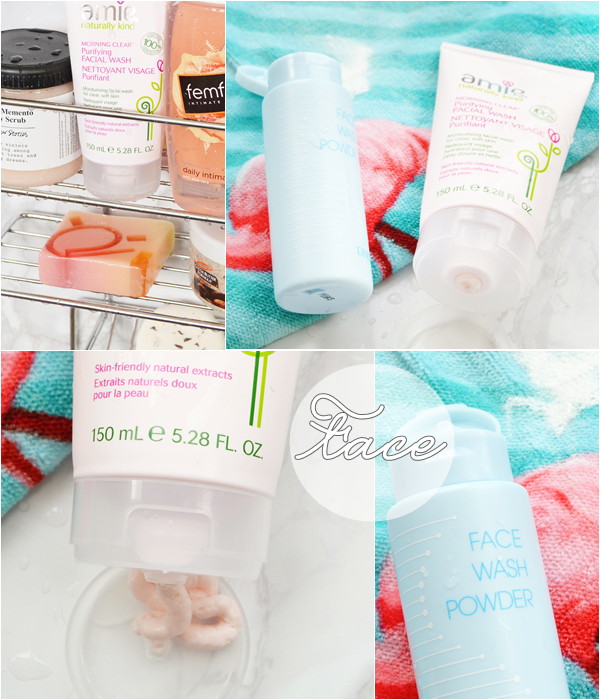 When it comes to washing my face in the shower I like to use a simple face wash as I never step into the shower with a full face of makeup on as I find mascara melts with the heat and smudges all over the face making it much more of a task to remove. So a face wash is there to remove any traces of makeup that hasn't been removed pre-shower and to remove any general grime or excess oil. For this reason I like the Amie Morning Clear Purifying Facial Wash (£4.95 - Amie here). This creamy feeling wash is gentle yet effective and again another pH-balanced formula to keep skin happy. I also love the elderflower scent to this. With combination skin I find keeping dry skin at bay to be something I have to keep on top of. I like to do this by exfoliating my skin with a non-abrasive corn starch powder such as the DHC Face Wash Powder (£9.50 - DHC UK here). The powder simply lathers up with water and is massaged over the face for a few minutes to cleanse away dead skin cells, revealing much softer skin. The powder can be used a few times a week and truly leaves the skin super smooth and free from dry patches. I also highly rate peeling creams however a powder exfoliator is much easier to use in the shower. 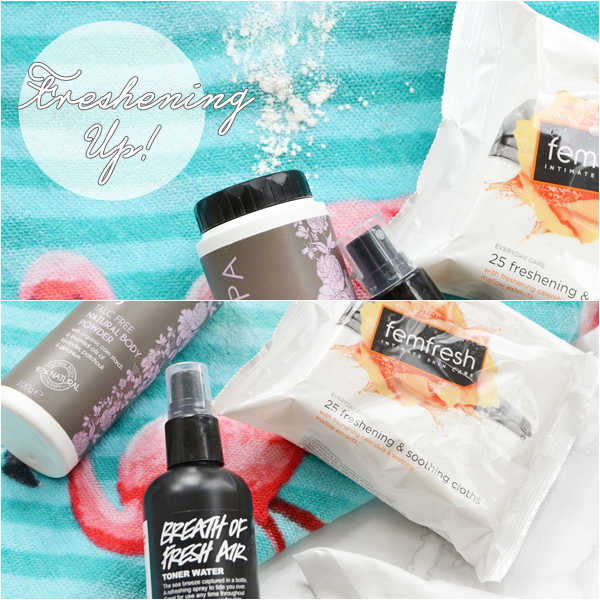 Lastly I wanted to touch upon freshening up and products that are great for feeling fresh. This could be in summer (when we are lucky enough to have a heatwave! ), when travelling or even post-exercise. Basically any time you are feeling a sweaty mess and need products to help you feel fresh and energised! Whenever I think of freshening up I think of the Breath Of Fresh Air Toner from Lush (£4.25/100g - Lush in-store), this is a product I've been re-purchasing for years now as it picks up my skin whether it's feeling dehydrated from too much central heating, hot and sweaty on holiday or I'm feeling tired at my desk - a spritz of this refreshing spray is all my face needs. As for my body I find wipes to be a great solution when a shower isn't an option. Again from femfresh, these Freshening & Soothing Cloths (£3.49 pack of 25 cloths - femfresh here) are simple to use, gentle on the skin with the pH-balanced formula to freshen up on the go. Perfect for hot days and for travelling with! Lastly another product that may seem out-dated to some; Talc. Yes, I use talc! Though the Natural Body Powder from Senspa (£4.50 - Waitrose here) that I like to use is actually talc-free. This natural body powder is great to use after a shower as it soaks up moisture to leave a silky touch to the skin and smelling of relaxing essential oils. Another product that is idea for a gym or swim bag as it makes getting dress that much easier. 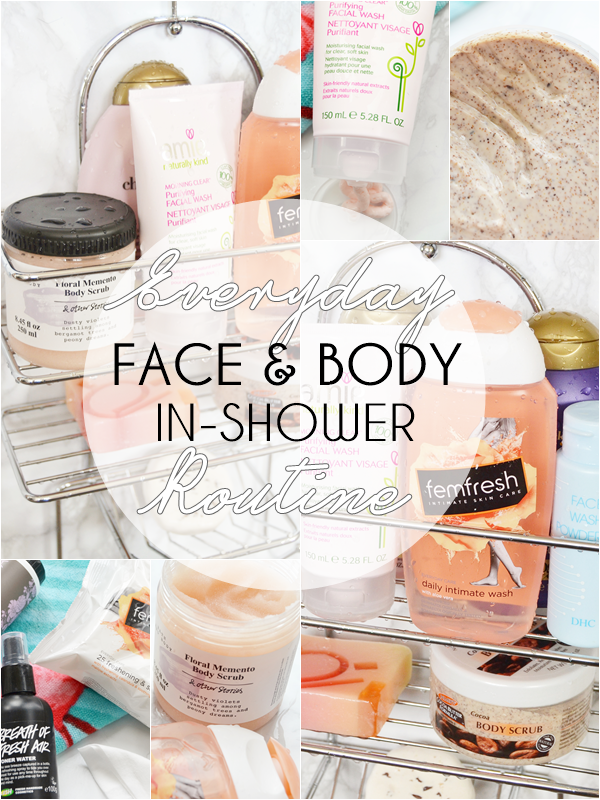 I hope you've enjoyed a little tour around what products I use in the shower and what I like to freshen up with. Let me know your own shower favourites?